While walking on a hill south of Nes Ziyyona in 2007, a hiker discovered several potsherds that had apparently been exposed by mechanical equipment (map ref. 17954–64/64602–12). The potsherds were later determined to date to the Late Bronze Age. In the wake of this discovery, the hill was declared an antiquities site. S. Zagorsky (pottery drawing) and F. Volynsky assisted in the preparation of the report. The site is located in an area of kurkar hills that was previously in the midst of farmland, between Nes Ziyyona and Tirat Shalom, and is today in the vicinity of new residential neighborhoods of Nes Ziyyona. The region is characterized by kurkar hills and sand dunes with valleys covered by alluvium and hamra. No Late Bronze Age sites are known to have existed in the immediate vicinity. A cemetery from that period was excavated at Dhahrat el-Humraiya, a site located c. 3.5 km to the west (Ory 1948). Pottery vessels, potsherds and a fragment of a lintel bearing hieroglyphics, all from the Late Bronze Age, were found in a survey at Tel Shalaf, c. 2.4 km to the south and at Trig. Point Z-102, c. 2.3 km to the southwest (Gorzalczany and Taxel 2001; Fischer and Taxel 2006; Goldwasser 1992). Other nearby sites are of a later date. At the el-Khirba site (Tell es-Sallaqa), c. 800 m to the east, remains ranging in date from the Persian to the Ottoman period were excavated (Nahmias 1999; Permit No. A-6373). Several archaeological excavations were conducted c. 1 km to the northeast, where architectural remains and water channels dating to the Byzantine, Early Islamic, Ottoman and British Mandate periods were exposed (Kogan-Zehavi 2006; Golan 2008; Golan 2009; Golan 2010; Golan 2011). At Sarafand el-Kharab (Yad Eli‘ezer quarter), located c. 2 km to the northwest, settlement remains were uncovered that existed from the Byzantine to the Ottoman period (Glick 1998; Gorzalczany 1998; Gorzalczany 2004). On a hill just northwest of the site, in the vicinity of Tirat Shalom, surveys were conducted where remains of a building were found dating to the Ottoman or British Mandate period. Finally, on a hill c. 600 m to the southwest, remains ascribed to the Persian and Hellenistic periods were found (Fischer and Taxel 2006). The potsherds that were found apparently originated in a tomb and date to LB II. 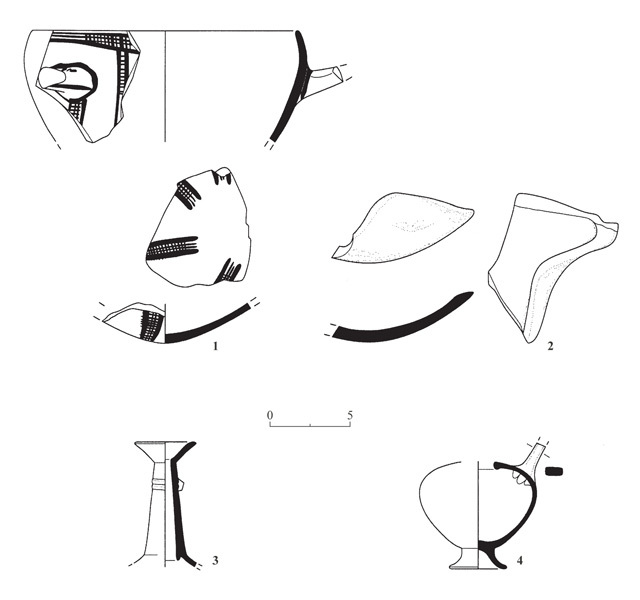 They include a Cypriot White Slip II bowl (Fig. 1:1), lamp (Fig. 1:2) and two Cypriot Base-Ring juglets (Fig. 1:3, 4). The nature of the purported tomb is unclear; it remains unknown whether it was part of an extensive necropolis, nor is it known to which settlement it belonged. Fischer M. and Taxel I. 2006. Yavne, Survey Map. HA-ESI 118. Gorzalczany A. and Taxel I. 2001. Tel Shalaf (Northwest). HA-ESI 113:73*. Nahmias K. 1999. Nes Ziyyona, el-Khirba. HA-ESI 109: 97*–98*. Ory J. 1948. A Bronze-Age Ce`metery at Dhahrat el Humraiya. QDAP 13:75–89.